I was terribly dismayed that little augury failed to list my post on Diana Vreeland in her Favorite Post Topic for 2009. Then I was further dismayed to find that I never uploaded my DV post. I looked and I couldn’t find it. I was sure it had been an early post, so I searched and searched and there it was, still in "draft" form in my March posts. It was meant to be an Etiquette Wednesday entry it never got posted. So in keeping with little augury’s admonition to post more on Diana Vreeland, and since today is Wednesday, here is the post that never was! Beginning in the 1930’s, Mrs. Vreeland was fashion editor at Harper's Bazaar. 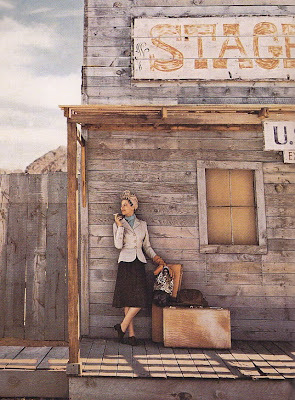 Her career at Bazaar began, however, with an unusual advice column entitled, Why Don’t You? a profoundly over-the-top collection of fashion, decorating, cooking, grooming and generally wild ideas to make the heads of the most creative of people quite literally -- spin! 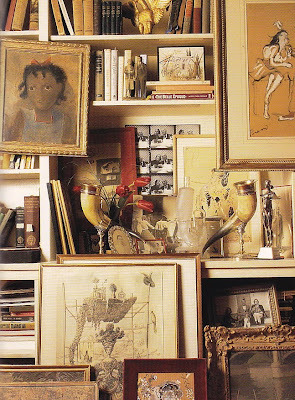 In 2001, John Esten collected much of Mrs. Vreeland’s advice into the book, Diana Vreeland: Bazaar Years. Why Don’t You? would be considered a bit over the top by today’s extravagant standards, so one can only imagine what these suggestions did for readers in the 1930’s. Vreeland wrote with an absolute disregard for the reality in which most of her readers found themselves living. Perhaps it was the very fantasy of her suggestions that kept them coming back to find out what Mrs. Vreeland was suggesting for the coming month. …give someone an enormous white handkerchief linen table-cloth, and in different handwriting and colors (black, acid green, pink, scarlet and pale blue) have embroidered all the bon mots you can possible think of? …have and elk-hide trunk for the back of your car? Hermès of Paris will make this. …turn your old ermine coat into a bathrobe? …bring back from Central Europe a huge white Baroque porcelain stove to stand in front hall, reflected in the parquet? …have a private staircase from your bedroom to the library with a needlework carpet with notes of music worked on each step – the whole spelling your favorite tune? 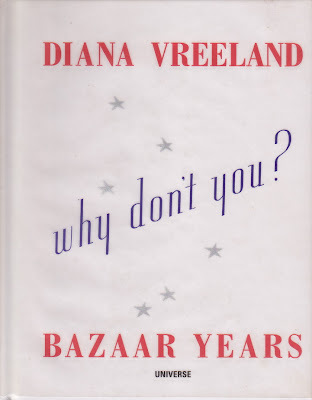 …read Diana Vreeland: Bazaar Years? Lucinda: so glad LA showed me the way to your doorstep. If DV had been southern, she probably would have been dismissed as just another eccentric. (We tend to grow them well south of the Mason-Dixon). I'd love an ermine (fake of course) bathrobe, wouldn't you? The best of the new year in your very amusing, intelligent, humorous corner of the world. mamacita: I think little augury should take on a weekly "Why Don't You?" column. home before dark: I think DV was a closet Southerner. Remember it is and OLD ermine coat, so it can be real. I mean the little guys have already gone home to Jesus, we should get a bathrobe out of it. Marnie: Love thinking of you in front of the fire with DV. I just requested this book from my interlibrary loan service. I can hardly wait. 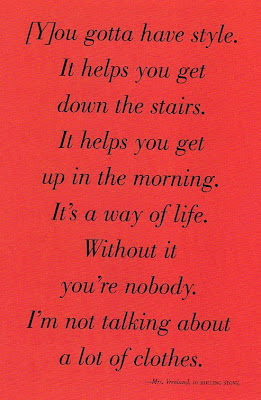 I first heard about this column from Kate Spade's book Style. Have you read it? I think you'd like it. Indeed diana have an awesome style! theres no doubt about it!